Last year, the Pension Integrity Project at Reason Foundation, together with Georgia Public Policy Foundation (GPPF), published a report identifying several causes of growing unfunded liabilities for the Teachers Retirement System (TRS) of Georgia — the retirement plan for the state’s educators and public school staff. 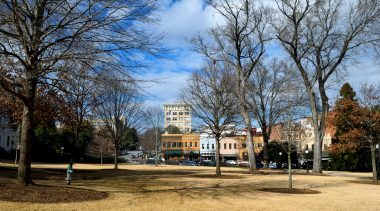 As of fiscal year 2018, Georgia TRS reported $18.6 billion in unfunded liabilities (based on a market value of assets) and an 80.2 percent funded ratio. The primary factors contributing to the growing pension debt — from $904 million back in 1998 to $18.6 billion in 2018— have been underperforming investments, missed demographic assumptions, and negative amortization. The adoption of a relatively rare “interest smoothing method” for determining contributions also appears to have had the unintended consequence of undervaluing how much should have been contributed to the system over the past six to seven years. 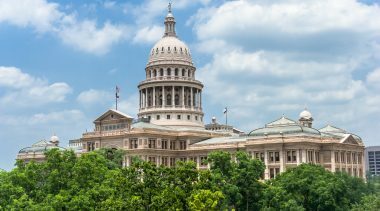 This week, changes have been proposed to Georgia TRS via House Bill 109, which was sponsored by several members of the House Retirement Committee. The proposed legislation would not make any changes for current participants or increase state contributions. 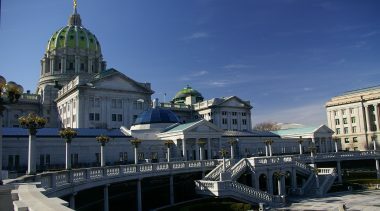 Instead, the bill would create a new tier of membership in the existing defined benefit plan for individuals hired on or after July 1, 2019. 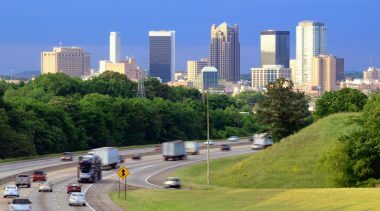 Georgia TRS is a final average salary defined-benefit plan, common across the country. Retirement income is determined using a formula based on the highest two years of salary that a member earns during their working years, the total number of years that they work, and a two percent multiplier. In order to qualify for any pension, a Georgia TRS member must work at least 10 years in the system — otherwise, they are only eligible to get their own contributions back. 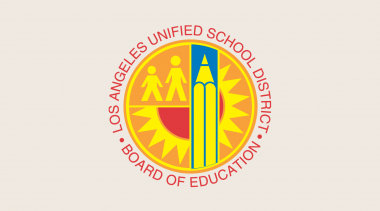 • And it would increase the allowable employee contribution rate range from 5-6 percent to 6-10 percent of payroll. We have estimated the fiscal effects of these changes going forward and evaluated how they would alter such key indicators as normal cost, actuarially accrued liability, and employer contribution rate projections over the next 20 years. Figure 1 shows the difference between the current expectations of Georgia TRS (baseline) and the proposed legislature (HB109). Over the next 10 years, the proposed change might reduce actuarial accrued liabilities (AAL) by around $341 million compared to baseline, and over 20 years it may reduce AAL by around $4.1 billion compared to baseline. By 2037, the AAL would be around 2 percent lower due to HB109. 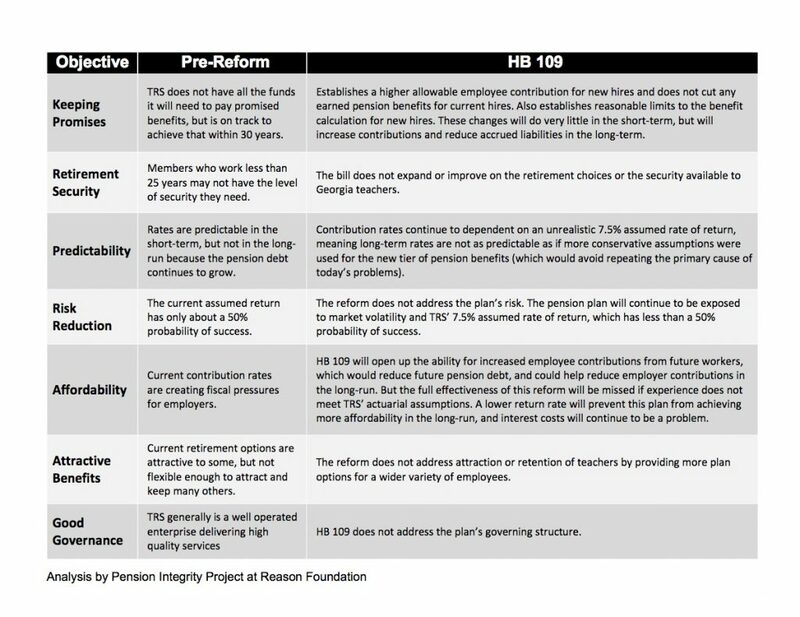 Source: Pension Integrity Project actuarial forecast of Georgia TRS plan and HB 109. 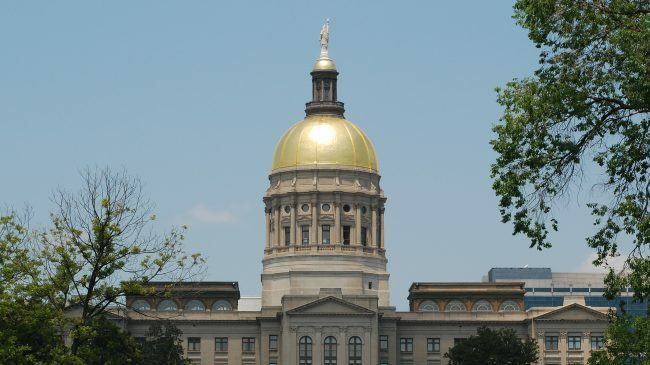 These additional contributions would come from those teachers and other members of Georgia TRS hired after July 1, 2019. Because of the reduced benefit design, in addition to having higher contributions, new TRS members will also have lower benefits and thus will add less to the growing amount of liabilities. Changing the growth rate for future pensions by lowering the benefits does not change existing unfunded liabilities. The $18.6 billion of existing unfunded liabilities still need to be paid down, plus any future accumulated unfunded liabilities. 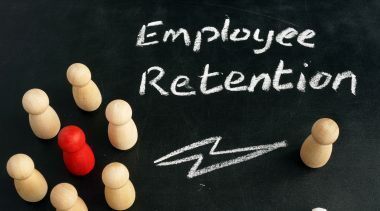 The additional dollars from future employees could reduce the amounts that employers contribute to Georgia TRS, thus keeping the same amortization schedule. 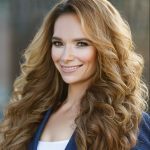 However, if the investments underperform, it influences the calculations of total liabilities and drives the required annual contribution of the plan up. Georgia TRS currently uses a 7.5 percent assumed rate of return. However, the average investment return for the plan has been 5.7 percent since 2001 and a rolling 10-year average return has never been above 7.5 percent since then either. In our 2018 report, we noted that Georgia TRS’s own analysis shows there is roughly a 59 percent chance it will earn a 7.5 percent return in the coming years. But 10-year capital market forecasts from BNY Mellon and JP Morgan Chase mapped onto the Georgia TRS asset allocation suggest the odds of hitting 7.5 percent in the coming decade may be closer to 20 percent. And even if Georgia TRS were to bounce back after another underperforming decade, it would have to have average returns considerably higher than 7.5 percent in the long-run to catch up. According to our analysis of Georgia TRS’ portfolio, taking into account forecast of returns from global investment companies, the plan is likely to see the returns of 6.5 percent or 6 percent. Our modeling of Georgia TRS shows that if the plan does not meet the 7.5 percent assumed return mark, then additional contributions from new hires would not be enough to prevent the system from having to raise additional funds from the state and schools districts, as it has done before. 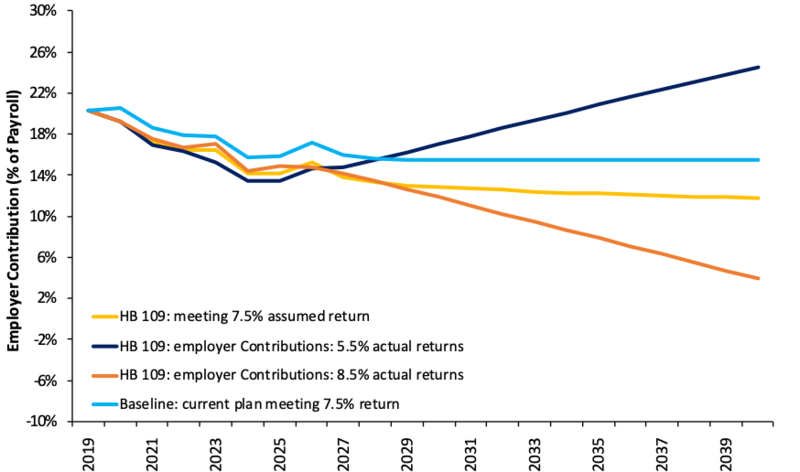 Figure 2 shows how employer contribution rates might change in the future if the actual average returns diverge from the expected 7.5 percent. 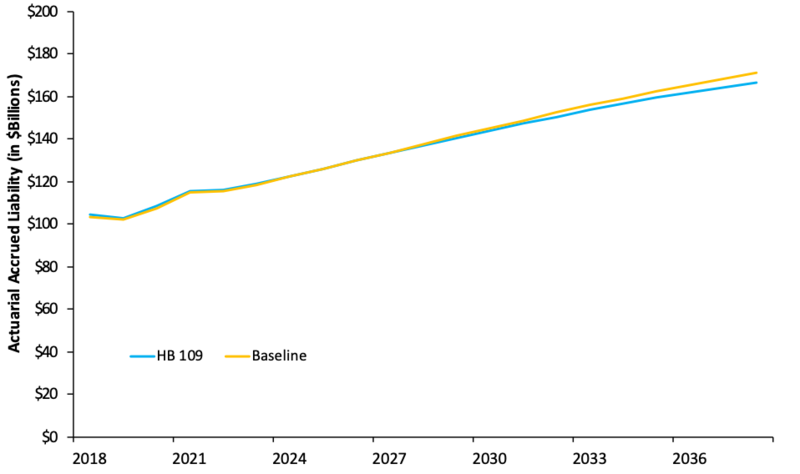 The yellow line shows expected employer contributions under the HB109 scenario. By 2030, employer contribution rates could be as much as 4.2 percentage points more than the expected scenario if actual returns between now and then are 5.5 percent. Source: Pension Integrity Project actuarial forecast of Georgia TRS plan (baseline) and HB 109. 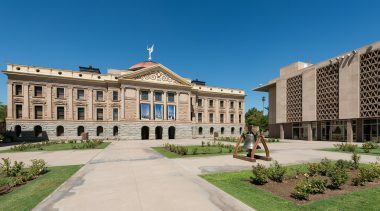 The proposed changes in HB109 may be reasonable as a means of reducing overall costs, even if the change is marginal. For example, in our review of pension plans nationwide, it is not uncommon to have final salary calculations determined using a 5-year period, nor is it uncommon to have retirement benefits start after retirees are 60-years-old. Further, employee contribution rates vary considerably around the country for teacher plans depending on whether the state participates in Social Security and the underlying costs of the plan — see this map for details. It should be clear that this analysis is not intended to suggest HB109 is either positive or negative. Rather, it is intended to measure HB109 against the findings of our report from 2018. Our analysis shows that the provisions of HB109 do not resolve the issues underlying the growing unfunded liability of Georgia TRS or meaningfully improve the solvency of the plan. As shown by the calculations above, it will have marginal cost-reduction for Georgia TRS, and, those reductions will come from raising contribution rates on the new members. More importantly, HB109 does nothing to solve the key variables that have contributed to the system’s debt, including underperformance risks associated with the rate of return, actual demographic experience not lining up with assumptions, or the time period Georgia TRS is taking to pay down unfunded liabilities that have resulted in negative amortization. As we noted in our 2018 report, a comprehensive approach to addressing the factors that have caused unfunded liability growth in Georgia TRS and that create a path to fiscal sustainability would include lowering the assumed rate of return and discount rate, paying down unfunded liabilities faster (such as reducing the years amortization schedule to the industry-recommended to 15-20 years), and adopting more regular experience studies and more rigorous stress testing to try and improve the reliability actuarial assumptions. 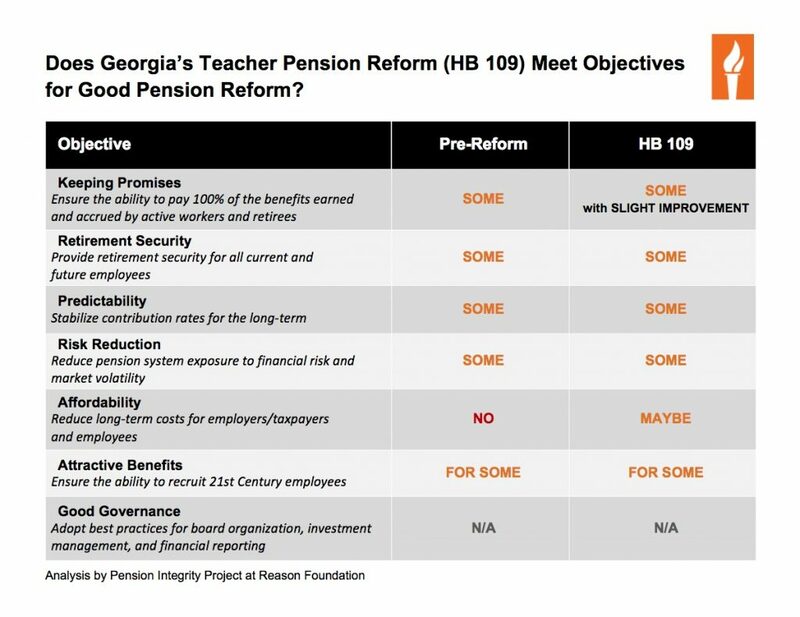 Does Georgia’s Teacher Pension Reform (HB 109) Meet Objectives for Good Pension Reform?